How to do your Best in Chess. To be honest, I intended to be on the beach today. But, it is raining here, so I am at home writing new useful information for you. Have you ever thought why some players get good progress in chess, while others don’t? Obviously it is not from a lack of educational materials. Nowadays there is an overabundance of easily accessible information. Of course most of the materials are bad, but there are some high-quality ones. Here is the answer: your PSYCHOLOGICAL properties bear influence on your chess progress. Most strong players know it and improve their psychological skills regularly. For example, I know that a lot of top players have a personal psychologist: Kasparov, Karpov, Topalov, Ponomariov and many others. Certainly they don’t make it publicly known. You may wonder how I know their secrets? Well, it is a long story and I will not write all the details, but you may trust me (by the way, I worked with the same psychologist as Ponomariov some time ago). It determines whether you play for a win against stronger opponents or only hope for a draw. 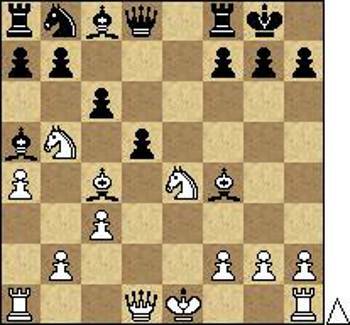 How effective your chess study is. Can you concentrate well enough during a game. Can you withstand competition and long psychological pressure. Are you nervous during a game? We may arrive at a conclusion, that psychology determines whether you can do your best during a game or not. That’s why it is so important. We have discussed the champion’s psychology in the course "The Grandmaster's Secrets". Now I would like to give you a few more recommendations. First, you have to expect things of yourself before you can do them. For example, you have to believe that you CAN beat a stronger opponent. I mean REALLY believe. This will improve your winning mentality, which is very important. Here I have a question for you: “Why some players have a champion’s psychology, while others don't?” I want you to think about it. You will get my answer, but your independent reflection will bear greater influence on you. Also I have the next chess task for you. White: Ke1, Qd1, Ra1, Rh1, Bc4, Bf4, Nd4, Ne4, pawns: a4, b2, c2, f2, g2, h2. Black: Kg8, Qd8, Ra8, Rf8, Bc8, Be7, Nb8, pawns: a7, b7, c6, d5, f7, g7, h7. Of course, you should not use computer assistance. Test yourself. I will give you a little hint: you should use a recommendation from the 3rd lesson of the course "How to Beat Titled Players". You will find the answer further down on this page. “The thing I don’t like in chess is the way you have to sit and pretend to think.”, - says one of my friends. I hope it is not about you. That’s why last time I asked you the question: “Why do some players have a champion’s psychology, while others don't?”. I hope that you answered this question for yourself. People remember their own ideas much better and perform them much easier. That’s why I didn’t give you the answer from the beginning. Here is what I think about it. Actually it is a very simple question. Why do some players have a certain set of knowledge/skills, while others don’t? This is because they have trained these skills. Therefore, if you want to improve your psychological skills and to form a champion’s psychology – you should train it. You should regularly spend some time and efforts on this aspect of your chess. I guess you want to know what exactly you should do regarding this. Let’s first realize what the problem is. Why didn’t we form a champion’s psychology in the first place? Psychological research states that people remember bad things 11 times better than good things. And we remember it 11 times longer too. When you are faced with problems, you have to make an effort to solve them. It affects you emotionally. Sometimes we have to stay in such a situation for a long time. That’s why we remember it so well. That’s why it breaks our self-confidence. That’s why so much players don’t even try to beat stronger opponents (by only hoping for a draw). That’s why so many players don’t REALLY try to win the tournament (agreeing for a draw in the last rounds and getting 5-10 places). Now you know what the problem is. So the question you should think about is “How to solve this problem?”. “How you can train a champion’s psychology?” Please, think about it. Here is the answer for the task I gave you last time. Two white pieces are attacked and it seems like they must retreat. However in the game white played 1.Nb5, putting the 3rd piece under an attack! This is actually the best move, which gives white an advantage. Now white is threatening Nc7. 1…cb gives white much more active position after 2.Bd5. That’s why black played 1…Bb4 2.c3-Ba5. Here is the next task for you. What should white do now? You should still use the technique from the 3rd lesson of the course "How to Beat Titled Players". Then it will be very simple. In the previous issue we have been discussing a champion’s psychology. I’ve told you that our brain automatically focuses more attention on problems, on negative experience. Thus we came to the conclusion, that you should consciously train your brain and form a champion’s psychology. So how can you do it? Here is one powerful recommendation about it. 1. Collect your best games and save them into a separate database. It may include not only your tournament games, but training games, blitz games etc. Choose the games which are really impressive in your opinion. 2. Look over these games sometimes. It is especially important to do it before your tournament game. It will bring you to your peak psychological condition. Though this recommendation seems simple, it has a great value and a strong impact on your results. Just try it first, and only then state your opinion. In the previous issue I gave you a task. Were you able to find the right move there? White: Ke1, Qd1, Ra1, Rh1, Bc4, Bf4, Nb5, Ne4, pawns: a4, b2, c3, f2, g2, h2. Black: Kg8, Qd8, Ra8, Rf8, Ba5, Bc8, Nb8, pawns: a7, b7, c6, d5, f7, g7, h7. In the game white played 1.Bd5-cd 2.Ng3. Though he won the game in the end, it was not the best decision. Let’s look again at the starting position of this example. 3 white’s pieces are under an attack. So your first impulse is to retreat or to do something else about it. However it is your emotional impulse. If you stay calm and confident, you will realize that there is no danger here actually. That’s why white should simply castle 1.0-0! After 1…cb 2.Bd5 white is dominating. 1…dc 2.Nbd6 gives white very active position also. 1…de 2.Nd6 is completely bad for Black. Thus you can see that there were no reasons to be afraid of black’s threats. It is a good example of how psychology brings influence on your chess moves and how it is important to form a champion’s psychology. Download GM Igor Smirnov's Video Chess Courses here!